Morning Teleportation, a five piece from Portland, OR, has a handful of different instruments in play on their debut album, Expanding Anyway, the Theremin being one of them. The Theremin is an electronic instrument; the controls are two metal antennas and it’s a no-hands kind of thing that controls oscillators for frequency and volume. The signals are amped up and sent through a loudspeaker. Essentially, it’s an instrument that can be played without being touched, and that basically is the bottom line of Expanding Anyway: Morning Teleportation play without exactly touching you. 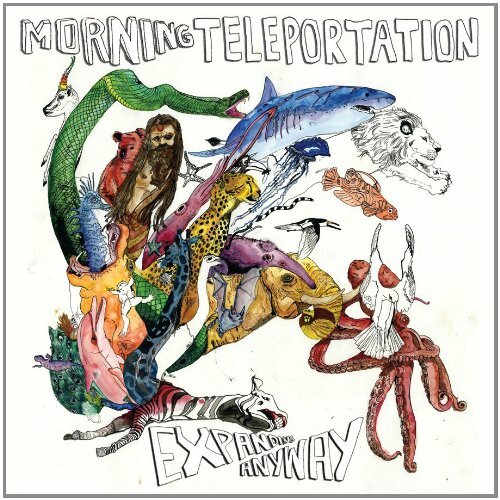 Morning Teleportation is, for some reason, being marketed as a psychedelic band but it lacks the dark sounds of true sketch-edge and the hallucinatory weirdness of legit trip music, so to call them psychedelic is a little nonsensical. Their debut album, Expanding Anyway, is produced by Modest Mouse’s Isaac Brock and the latter band’s bright guitar melodies and twanging waves of grimy farm guitar have made their way into the intricate, hyper-active layers of Morning Teleportation’s entire album. Expanding Anyway is also the title track on the album; it’s psychedelic in the way a teenager tripping on a few grams of mushrooms is psychedelic; merry, unchallenging, and pop-fun. I’d be excited to listen to this band again in a few years, once they’ve moved into their proverbial early 20’s and start experimenting with DMT or something. The official music video for ‘Expanding Anyway,’ has all of the typical staples found in a psychedelic-lite product in 2011: Painted naked kids running through a field, neon mushrooms, trippy spirals and cute, bizarre animations. Basically being marketed as a psychedelic band in 2011 seems to have nothing to do with actually having some sort of face melting experience caused by tripping out to music that rearranges your brain matter. The video seems to stand as some sort of microcosmic example of the band’s style: A bit safe, familiar, but generally enjoyable. It’s tame, friendly fodder for the day trippers who dig the unchallengeable middle ground of a mild experience. Synth and catchy melodies amount to formulaic compositions and slick vocal lines that get tangled in your head a bit; boppy party fun, about as psychedelic as doing too many bong hits in your bedroom at night. Crystalline stands solid with strong melody lines that stand tall above a bed of worming guitar and sunny, colorful bright rock. And with their lyrics on the title track jauntily exploring the concept of pushing love’s boundaries, it makes for some vapid, happy thought processes that might even border on lackadaisical self-exploration. Treble Chair washes away the end of the album with an oceanic synth sound, soft, cushy, pixelated peace noise that suits the closedown of the album in a soothing way; it’s probably their most genuine tripped out track, with a looser construct and the power to let you close your eyes and drift off a bit. The whole thing weaves together well as a whole but doesn’t really strike you right in the heart, and definitely never comes across as thoroughly psychedelic; the hard dosers probably won’t ever associate Morning Teleportation with some sort of hallucinogenic trip; they sound more like Vampire Weekend eating weed cookies and doing a few light bennies. It’s dancey-pop that would probably make for a good live show at a sunny day festival, and when it’s over, you don’t really feel like you’ve just had some psychedelic musical experience; your spirits may be brighter, maybe your friends dug it as pleasant background party music, but at the end of the day, it doesn’t shake the earth or change your life. Previous PostPrevious Le Tigre Who Took The Bomp? Le Tigre On Tour (Oscilloscope Laboratories, June 7) The Le Tigre Tour Film Is Finally here!